Those boots??? OMG, I’m absolutely coveting them!! Hey JoLynne – LOVE this outfit! You are absolutely crushing it lately. 🙂 One question – you mention that neat cuffs on jeans are on the way out. Any suggestions on how we might handle the denim/ankle boot dilemma going forward? I see a lot of other bloggers just letting them hang and crunch over the boots (lol – crunch is for lack of a better word) or for a neater look, tucking them in. But that requires skinnies that are super skinny at the ankle, and boots with a shaft big enough to allow them to fit inside without getting all bulgy. It’s still a case by case basis, depending on the booties and the jeans. I do let my jeans just fall with some of my other booties, but with this pair, it wasn’t really working. Great look… love the trees in the back ground. Our fall here was short and its been looking more like Christmas then ever. I know neat cuffs are put and untidy, casual cuffs are in but really, do we need to follow this trend? Or, do you mean cuffing your jeans is out altogether? This fashionista 🤪 needs to know! Your jacket repeating the color of the boots is perfect. Love the boots! I’d like to see them styled with a sweater dress. Way to go on getting your shopping done for the family in VA! Doesn’t it feel good to have that out of the way. We have two gift cards to get and we’re done. This is a very nice outfit. I get so aggravated with necklaces that get all twisted unless I sit like a statue. The sun is shining a d the high willbe in the upper 60’s or low 70’s today. Can’t get much better! Have a fabulous day! I adore this whole outfit! Those booties are fabulous. I’m loving all the snakeprint right now. I still haven’t been able to wear my mules like this, but I’m dying to soon! And you know I love that jacket because I ordered it immediately the other day, lol. I’m so hoping it fits. I have so many issues with finding jackets that work with my broad shoulders. Fingers crossed…it should be here today! Hi! I love the mixture of textures and pretty neutrals in this outfit, too! I always have to cuff my jeans (the joy of having shorter legs)…Do you have some in style cuff suggestions? I’m curious about the socks. Will you let them show between the jean and the boot? I have seen other bloggers wearing socks that show, but they are the white crew socks with stripes. 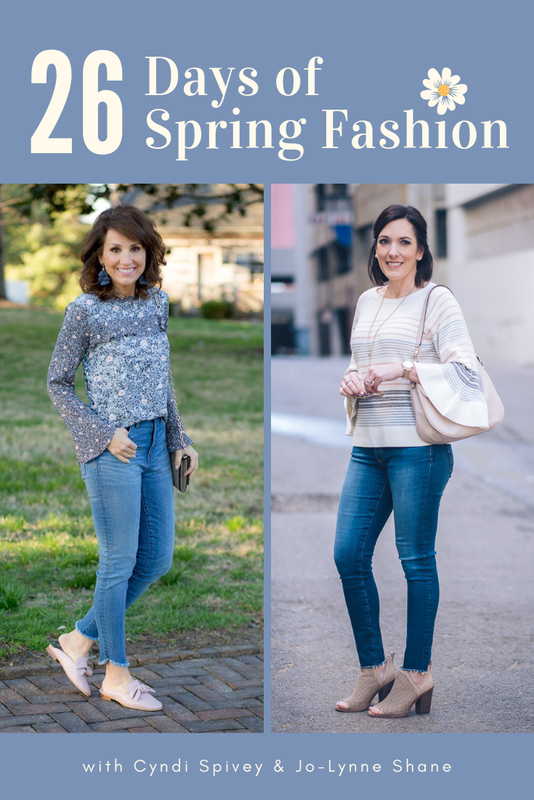 I love the cuffed jean look and will risk being “unfashionable”! Lol! You look fantastic in that outfit! I love everything, especially the boots! They are on my Christmas wish list! Have a wonderful Thanksgiving and thanks for all you do! I don’t mind if they’re visible when I move around. I cuff my pants so they’re pretty much on top of the bootie, so I’m not leaving a gap. Did you know that Jcrew lets you take advantage of a sale price on an already purchased item as long as you call within seven days of the original purchase? So your tank would be eligible for the extra discount as long as you are within that time frame. Hope you can take advantage! I was wondering if they’d do that! I think I’m going to have to buy that suede moto jacket as I missed it last year- glad to see it back and restocked! It’s perfect for our mild CA winters. Your outfit is cute! I I can’t personally do snakeskin booties – I’d feel totally out of my comfort zone – but I have never really liked snakeskin on anything. I have been wondering about the rolled cuff. A very fashionable friend of mine still rolls hers sometimes with booties and looks cute & trendy so I’m going to say “go for it” 😘 But I guess it all depends on the length of the jeans and the height of the boot right? I think a lot of people are still cuffing. I see it in person too on people who seem to know what they’re doing, lol. At least, I like the look of it on some people. But yep, at the end of the day, it depends on the jean and height of boot… and probably a little bit on one’s personal style. Love this look! Great booties!! Interesting discussion on the cuff or no cuff with jeans and booties. I had no idea cuffing is going out of style lol. I’ve been letting mine fall where they may for the most part (full disclosure: being lazy), but today I cuffed since the jeans were just a tad too long otherwise.